Dian Niaga (dee-AHN nee-AH-gah) brings us these handbags from the Southeast Asian island of Borneo. Created by world-class designers, these lovely, substantial bags are individually hand crafted for quality and durability by artisans living around forest preserves. 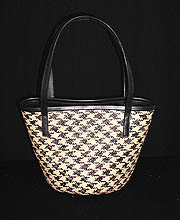 These handbags are made from sustainably harvested rattan palm fiber. Rattan is a palm that only grows in natural forests, but within the forest it can be easily replanted. Your purchase of these value-added finished goods creates incentives to keep these forests standing. These products are the result of one of the finest projects in the world addressing the connection between natural resource conservation and local, sustainable economic development. Dian Niaga Eco-Traders is a non-profit organization based in the state of Kalimantan on the island of Borneo. They invest in biodiversity conservation and in assisting local communities, and are the marketing end of a participatory community forest project. Dian Niaga undertakes this challenge: providing direct links between small community-based enterprises and potential local and international markets, thereby promoting local development and forest conservation. This project is developing a variety of small-scale enterprises, all using forest products other than timber. Proceeds from the sale will support Dian Niaga and their efforts to nurture artistic traditions, provide employment, and promote conservation. The Borneo ecoregion in which Dian Niaga works is among the richest in the world for floral diversity, exhibiting many mountain plant species, including many species of orchids and rhododendrons not found elsewhere. Please read our section on Borneo to find out more about this beautiful place and the intriguing orangutans who call it home.